Cedric the entertainer has launched his own podcast to talk about “this crazy world.” He is a farily well known name (he's appeared in movies, does stand up, and recently hosted “Who wants to be a millionaire.”). I email soundcloud.com as I could no longer find the direct link to the mp3 file to put on my website. Their response was dig it out of the RSS feed and sent me a link to my RSS feed, and a screenshot of where the file was. This is not convenient, and furthers my thoughts that this is just not ready for prime time. They have been in beta for THREE YEARS. Also I said that a media host should NOT mess with my file. What I upload is what I want to download. If a visitor uses the download link they get your file (great). However, the file that is included in the RSS feed has it's name changed to a rather lengthy name. I was testing this on my Jillian Michaels Fan cast and the original file was titled, “jmp43_052914.mp3 ” and the file available for download is “152162769-podcastcoach-podcast-review-show-ask-the.mp3” which to me is messing with my brand. Mike Phillips of Computer2know.com let me know that if you Google the address to podbean it comes up as a virtual office. Lawyers often will use these to look more official than they might be at the time. I'm not saying that this is what podbean.com is doing, but I do find it odd. If you missed it, you can check out last week's episode. Justin from braverbytheday.com is using Opimizepress and is thinking of leaving this file and wants to know how to move to a new theme. In some cases you can simply switch themes in the wordpress dashboard. A wordpress theme is like, “Clothes” for your website. The content is the same, but the look is different. One way to test things before publishing them is to use software like WPSimulator (affiliate link) that allows you to run WordPress on your PC computer. Once you get it finished, you can upload it to the web. Another (cheaper) alternative is to buy a domain name, and create what others call a “Staging” site. Then once it's done here, you simply move it to the “real” site. In some cases you web host will allow you to have more than one domain under the same account. August 16-17 in Dallas Texas (I'll be speaking at this one). This should be something you want to talk about all the time, you think about all the time. The more detailed a picture you have, the better your content will. What do I hear about the why? I had a background in radio. –This is why you are capable, but not why you should start. This is why if you start, you’ll be slightly ahead of the game. A person has experience as a public speaker. They decide to “nice down” and do a podcast an interview small business owners. They want companies that are between 1 and 20 employees, and do less than 1 million a year. They want to hear about the trials that the small business person went through to build their business. They might even focus on business local to their area. What does your content do for your audience? Do You Have the Time to Do it RIGHT? Plan on spending four minutes for every minute of podcast. That’s to create the show. How much time is left in your life to promote the show you just created? Does this mean you don't podcast? NO! It means you make shorter episodes (or publish less frequently). Who – Your audience. What do they want to hear? What do you want them to DO with your content? Why – Position the topics that your audience wants to hear so that they are aligned with your goals. How – Does the format (interviews? ), length, and publishing schedule align with your life and goals for the podcast. 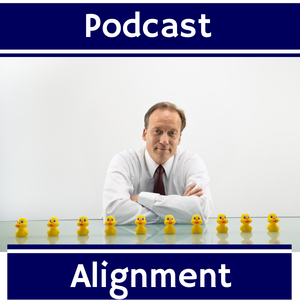 Is your Podcast In Alignment? I’ve done my fair share of podfading over the years. I definitely think it’s better to let something go than to try and keep it alive if you’re no longer enjoying the process. And my wife does a podcast with three other people. Two of the hosts are on the west coast, one is in the midwest and the other’s on the east coast. It’s always a challenge for them to schedule a recording time.